The Place to go when you need to know. Each day the library is available to the children from about 9:00 to 3:15. Parents and visitors are always welcome but please don't forget to check in at the office first. 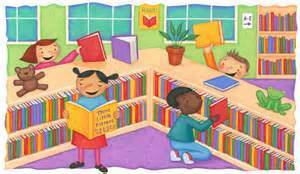 Each class has a weekly time they visit the library to check out books. The primary classes also listen to a literature based lesson with Mrs. Gonzalez. Mrs. Curtis teaches library skills to all the 3rd - 5th grade students. All lessons and skills correlate with Oklahoma PASS standards and the National Common Core standards. Students also use the library for researching and its reference resources. While listening to quality literature, students are activley involved in learning critical story elements and other valuable reading skills each week. Students in grades 3-5 are taught Research and Information Skills while incorporating quality literature. Mrs. Gonzalez has her classes scheduled in the afternoons. Mrs. Curtis teaches skills classes in the mornings.